With credit institutions still reluctant to provide financing to start-ups, many companies are looking for new ways to raise funds. Others are exploring ways to integrate new technology such as Distributed Ledger Technology (DLT), Blockchain and SmartContracts into their existing business models. Either way, initial coin offerings (ICO) or initial token offerings (ITO) are currently trending. Coins and tokens may serve various functions: They can be structured similar to equity (shares) or debt instruments (loans), they can serve as types of vouchers (utility tokens) or they can be “naked” tokens (“cryptocurrencies”) striving to become the “new” Bitcoin or Ether. While many regulators in Europe are still silent on legal questions in connection with ICOs / ITOs, we have put together a concise picture of the current regulatory roadmap for the jurisdictions covered by Schoenherr. This guide has been prepared for information purposes only and does not purport to constitute (nor may it be interpreted as substituting) legal advice or to be exhaustive in any respect. It is based on the relevant laws and regulations as of 1 March 2018 and may therefore not present an accurate picture of the legal situation in future. The authors of this guide, Schoenherr and any of its officers, directors or employees, advisors or any other third party accept no liability, duty or responsibility with respect to the content of this guide or the conclusions drawn from its content. Are cryptocurrencies like Bitcoin and Ether regulated in your jurisdiction? Bitcoin and Ether are not regulated under Austrian law. The Austrian Financial Market Authority (Finanzmarktaufsicht – FMA) has issued several warnings on cryptocurrencies and their volatility. Depending on the business model, anti-money laundering (AML ) obligations under the Austrian Trade Code (Gewerbeordnung – GewO) may apply. The AML under the financial services legislation does not yet apply to professional cryptocurrency traders. Cryptocurrencies like Bitcoin and Ether are not yet regulated in Bulgaria. The Bulgarian National Bank (“BNB”) and the Financial Supervision Commission (“FSC”) have given formal opinions on the regulatory treatment of cryptocurrencies as part of court proceedings. According to the BNB, Bitcoin is not legal tender in Bulgaria and bitcoins are not “funds” or electronic money within the meaning of the Bulgarian Act on Payment Services and Payment Systems (“APS”). The FSC, which is the authority that regulates trading in financial institutions, states that bitcoins and similar cryptocurrencies are not regarded as financial instruments and do not fall within the scope of the Bulgarian Market in the Financial Instruments Act (“MFIA”) (implementing MiFID). The FSC outlines, however, that in cases where cryptocurrencies are underlying assets of derivatives, trading in such derivatives is an activity subject to licensing as an investment activity. The court practice, which is not very extensive on the matter, supports the conclusions of the BNB and the FSC. The Bulgarian Tax Authority, on the other hand, stated in a formal opinion issued in 2014 that the income received by selling and exchanging bitcoins should be declared and taxed. The taxable basis will be the accumulated profit from the sale and exchange of cryptocurrencies throughout the taxable year less the price for which the cryptocurrency was purchased by the taxable person/entity. Apart from these formal opinions given in 2014, there is no recent official position or statement by the Bulgarian authorities which would be competent in case of the regulation of cryptocurrencies in the future. In a recent informal statement on cryptocurrencies in December 2017, the BNB governor said that Bitcoin and other cryptocurrencies are not money or digital currency (e-money) which will be issued by banks in the future. Cryptocurrencies are speculative assets, which is why they remain unregulated. Cryptocurrencies like Bitcoin and Ether are not yet regulated in Croatia. According to the Croatian National Bank (“CNB”), Bitcoin and Ether neither fall within any regulated category of means of payment nor constitute money or electronic money. Transactions involving Bitcoin or Ether should not constitute a payment service under the Croatian Payment Transactions Act. Accordingly, the CNB does not issue a licence to businesses issuing or trading in virtual currencies nor does it have a legal basis for their supervision. The Croatian Tax Authority, on the other hand, has stated that Bitcoin is equivalent to a money-market instrument and thus capital gains tax is applicable. This conclusion may be attributed to the Tax Authority’s desire to forcefully subsume Bitcoin under one of the expressly stipulated types of financial assets in order to be able to levy tax; thus it is questionable whether this opinion should be used for future interpretations of the legal status of Bitcoin or any other token. Except for a couple of opinions/statements of the CNB and the Tax Authority, no particular guidelines are available. Nevertheless, the CNB announced that it will closely follow EU regulations. Therefore, in view of the ECJ’s judgment in case C-264/14, Bitcoin should not be considered as tangible property, as a security conferring a property right or as a security of a comparable nature, and the same should apply to Ether. Finally, the CNB recently formed an internal taskforce to deal with FinTech, and therefore further actions/opinions/statements may be expected. Cryptocurrencies are unregulated in Hungary and not considered as a form of money. No guidance is yet available as to the regulatory treatment of cryptocurrencies, but the Hungarian National Bank is investigating the topic. The regulators have issued warnings with respect to the potential risks. Cryptocurrencies are unregulated in Poland. The National Bank of Poland (the “NBP”) and the Polish Financial Supervision Authority (the “PFSA”) issued a joint release on 7 July 2017 indicating the unregulated legal status of cryptocurrencies. The NBP also added that cryptocurrencies are not a form of electronic money (within the meaning of the legislation implementing Directive 2009/110/EC on the taking up, pursuit and prudential supervision of the business of electronic money institutions) and not a valid payment instrument. The NBP advised caution with respect to investment in cryptocurrency due to potential risks for investors and the financial system. The PFSA issued an additional release on 22 November 2017 confirming the unregulated legal status of cryptocurrencies and issued a warning with respect to ICOs due to the lack of supervision and potential breach of financial instruments / investment activity regulations, although according to the PFSA, this needs to be evaluated on a case-by-case basis. Cryptocurrencies are unregulated in Romania. The National Bank of Romania (the “NBR”) issued a press release in 2015 indicating that they do not consider cryptocurrencies as currency and noted that the acceptance as payment of cryptocurrencies is not mandatory. The NBR also added that cryptocurrencies are not a form of electronic money (within the meaning of the legislation implementing Directive 2009/110/EC on the taking up, pursuit and prudential supervision of the business of electronic money institutions). The NBR stated that it monitors the evolution of cryptocurrency schemes from the perspective of potential risks for the financial system. It did not issue any formal indication on whether cryptocurrencies may be seen as payment instruments, mainly due to the very scarce use of cryptocurrencies in Romania for payment purposes, rather than its broader use as investment instruments. Nevertheless, the NBR may consider such classification in the future. In relation to its 2015 press release, the NBR issued another statement in February 2018 in which it drew attention to the high risk of people losing the money they invest in virtual coins. The NBR noted a rise in interest in virtual coins, especially Bitcoin, both in terms of holding and trading and as a business. In the press release, the NBR stated that in order to avoid reputational risk exposure at the level of credit institutions it discourages any involvement in virtual currencies, including in terms of providing services to entities that provide investment or trading services in these currencies. In February 2018, the Financial Supervisory Authority (the “FSA”), which is the supervisory authority for capital markets in Romania, posted a pan-European communication on its website issued by ESMA, EIOPA and EBA to raise awareness among retail investors about the risks of buying and trading virtual coins. Also around the same time the FSA issued another warning about the high risks of investing in financial contracts for differences (CFDs) on cryptocurrency. The Romanian courts refer to cryptocurrencies mostly in criminal disputes, which largely concern the use of cryptocurrencies as means of payment for illicit transactions, but also in civil disputes (e.g. a case where a cryptocurrency exchange filed suit against a trader to be able to return fiat to that trader for a wrongfully processed transaction). The court practice does not qualify cryptocurrencies in any manner. The buying, storing and trading of virtual currencies is still largely unregulated in Slovenia. Pursuant to some of the most recent guidelines and statements by the Slovenian Tax Authority (FURS) and the Bank of Slovenia (issued in January 2018), cryptocurrencies should not be considered monetary assets (denarno sredstvo) or financial instruments; nor are they electronic money, due to their own denomination. They can, however, legally be used as payment instruments. To date, FURS has issued several guidelines on the tax treatment of virtual currencies. As a general rule, any income (irrespective of its form) is taxed pursuant to standard income tax provisions; however, capital gains from trading cryptocurrencies are not subject to income tax, unless such income is generated within a business activity. Proceeds derived via the “mining” of cryptocurrencies are taxed as any other income under the category of other income (drugi dohodek), using the BTC/EUR exchange rate at the time when the income is received. As for VAT, if the issued tokens are specifically designated for the purchase of particular products/services or have the characteristics of financial instruments, the issuance of tokens is subject to VAT. The guidelines also address certain other VAT aspects linked to the purchase of software and hardware for mining and to managing of trading platforms. In addition, the Slovenian Office for Money Laundering Prevention has issued a formal statement that the AML regime should in principle fully apply to the issuance and management of virtual currencies. Otherwise the topic of cryptocurrency has received a lot of attention in Slovenia and regulation (and regulatory priorities) in this respect is regularly discussed. Is trading Bitcoin and Ether a regulated activity? Cryptocurrencies such as Bitcoin and Ether are not considered financial instruments and hence trading in them is not regulated. However, the FMA has stated that derivative instruments referencing cryptocurrencies or tokens will qualify as financial instruments under MiFID II and hence regulation may apply. Trading in Bitcoins and Ether is currently not subject to licensing/registration. Cryptocurrencies are not considered financial instruments and hence trading in them is not regulated. However, derivative instruments (e.g. CFDs) referencing cryptocurrencies or tokens may qualify as financial instruments under MiFID II and hence regulation may apply. Trading cryptocurrencies is not regulated in Poland, although the regulators have issued warnings with respect to the potential risks. Trading cryptocurrencies is not regulated in Romania. Recently, the NBR ordered the blocking of certain bank accounts of persons who traded Bitcoin in order for the public authorities to verify the origin of the sums and whether they come from transactions or from mining activities. Some credit institutions, such as ING Bank Romania, decided to close the bank accounts of their clients which had sums coming from transactions with Bitcoin. When companies issue their own individual tokens/coins, does the initial coin offering (ICO or ITO) trigger any securities law, capital markets law or financial services regulatory requirements? Depending on their exact terms & conditions, tokens issued by start-ups or as a financing instrument might constitute (a) financial instruments within the meaning of MiFID II or (ii) securities within the meaning of the Prospectus Directive. ICOs/ITOs are still unregulated in Croatia. However, certain ICOs/ITOs as well trading with certain tokens could easily fall under the provisions of the Croatian Capital Markets Act. This would primarily depend on the structure of the ICO or token, i.e. 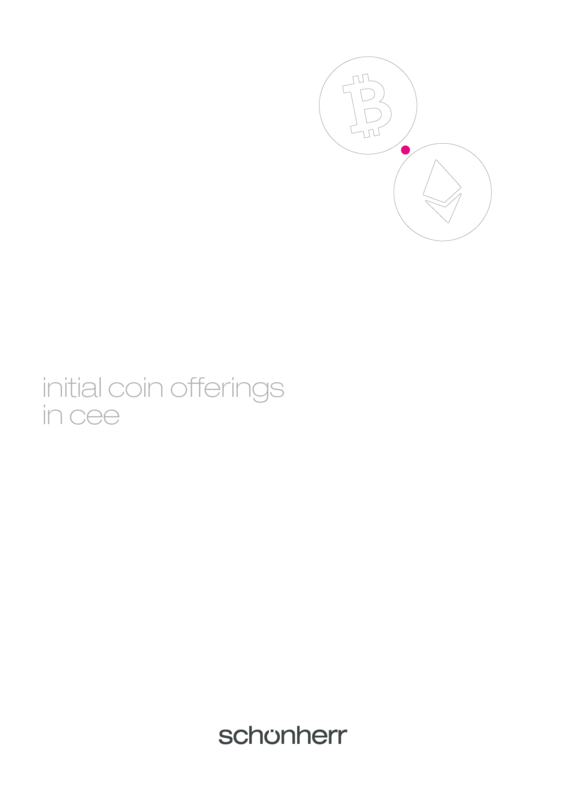 whether the token would represent a certain type of asset or right (e.g. equity, securitised debt, etc. ), and hence be a financial instrument. Accordingly, entities trading or intermediating with such tokens might need to obtain a licence from the regulators, although there is still no precedent in that respect in Croatia. Recently, a high-ranking officer of the Croatian Financial Services Supervisory Agency (“HANFA”) stated privately that HANFA should consider tokens as a security. ICOs/ITOS are not regulated in Hungary. Depending on the structure of the ICO/ITO, it may be deemed as offering of securities (e.g. if the token represents rights to participation or assets) or as collection of funds from the public. The PFSA reposted two ESMA briefings on ICOs on its website. It noted that the firms involved in ICOs may have to comply with the regulations applicable to financial instruments and securities transactions, as well as investment fund activity, including relevant regulatory approvals. The PFSA believes that advice on qualification in respect of the relevant provisions should be sought on a case-by-case basis. The FSA reposted two ESMA communications on ICOs on its website and summarised the content of the communications (in Romanian). The FSA noted that firms involved in ICOs will have to comply with the regulations applicable to securities and securities transactions, quoting the Prospectus Directive, MiFID, AIFMD and AMLD4. It is therefore conceivable that the FSA will qualify ICOs as securities. If it does, ICOs/ITOs will have to observe the requirements in the existing securities legislation. Advice on such qualification should be sought on a case-by-case basis. The issuance of coins/tokens is generally not regulated and/or supervised. According to the most recent statement by the Slovenian Securities Market Agency (issued in January 2018), although certain coins/tokens have certain substantive characteristics of “transferable securities”, these cannot be qualified as such within the meaning of the Slovenian Markets in Financial Instruments Act, as they are not issued in a way foreseen by the current legislation. Consequently, ICOs should not be considered as being subject to the provisions applicable to public offerings of securities. Certain coins/tokens could, however, be qualified as derivative financial instruments under the current regulatory framework, as only the substance of such instruments and not the form of their issuance is relevant for their qualification. In such a case, the issuer could be considered as providing investment services, which is generally only reserved for investment firms and banks. Furthermore, if such coins would be traded in an organised way, the trading venue would have to be registered either as an organised market or as a multilateral trading system, whereby the rules on transparency and market abuse would also apply. Is trading individual tokens/coins considered a regulated activity? Depending on their exact terms & conditions, tokens issued by start-ups or as a financing instrument might constitute (a) financial instruments within the meaning of MiFID II or (ii) securities within the meaning of the Prospectus Directive. Trading in such instruments could hence be subject to banking licensing requirements. Investment services relating to such instruments may be regulated services under MiFID II. Depending on the specifics of the particular ICO/token, a licence from the regulator could be needed, although there is still no precedent in that respect in Croatia. To the extent that coins/tokens are considered as securities, their trading will be a regulated activity. To the extent that coins/tokens are considered as securities, their trading will be a regulated activity (i.e. securities trading). We cannot exclude that where tokens express or represent regulated assets, the trading of such assets will eventually be deemed a regulated activity subject to licensing or other regulatory treatment. To the extent that coins/tokens are regarded as securities, trading them will be a regulated activity (i.e. trading of securities). Where tokens express or represent regulated assets, we cannot exclude that the trading of such assets will eventually be deemed a regulated activity subject to licensing or other regulatory treatment. If individual tokens/coins are structured as "utility tokens" could this be qualified as provision of payment services? Would it make a difference if the tokens/coins are accepted only by the issuer or also by third parties? If tokens are structured as “utility tokens”, it must be ensured that such tokens can only be used within a limited network as defined in PSD II. We would assume that individual tokens/coins structured as “utility tokens” would not qualify as a payment service under the APS. According to the APS, services based on instruments that can be used to acquire goods or services only in the issuer’s premises or only within a limited network of service providers or for a limited range of goods or services on the basis of a contract between the issuer and the service providers are not considered payment services and are therefore excluded from the scope of the APS. According to the draft bill submitted for voting in the parliament, the new APS implementing PSD II will also exclude services similar to “utility tokens”. We would assume no “utility tokens” would be qualified as providing payment service under current law. According to the current Croatian Payment Transactions Act (art. 4/11), services based on instruments that can be used to acquire goods or services only in the issuer’s premises or only within a limited network of service providers or for a limited range of goods or services on the basis of a contract between the issuer and the service providers, are not considered as payment services. If tokens are structured as “utility tokens”, it must be ensured that such token can only be used within a limited network as defined in PSD II. Currently, both the NBP and PFSA are of the opinion that the cases described in the query are outside of the payment services regulations. Qualification as a payment instrument cannot be excluded for cryptocurrencies if their use for actual payment expands. We believe it can be argued that the use of utility tokens should fall under the limited network exception in the Payment Services Directive 2. The treatment of utility tokens and whether their issuance triggers any licensing requirements linked to the provision of payment services remains to be clarified in Slovenian legal practice. In any event, we believe that if such transactions were indeed considered covered by the Slovenian Payment Services and Payment Systems Act (implementing Directive (EU) 2015/2366 – PSD2), the issuers of utility tokens could rely on the limited network / limited goods or services exemption. Have there been ICOs/ITOs in your jurisdiction? If yes, is the volume known? There have been approximately 5–6 ICOs in the Austrian market with further ICOs coming in the months ahead. There have been a few successful ICOs in Bulgaria. Some of the most successful were for the companies Aeternity (raising USD 35 million), AdEx (raising USD 12 million), and Lockchain (ICO still active). There are no official statistics on the number of ICOs in Bulgaria. We know of two ICOs having some connection with Croatia: i) DA Power Play (ended in September 2017, raising USD 2.6 million) and ii) CryptoTask (ICO began on 3 February 2018, with 1,003 ETH tokens collected in pre-sale). We are not aware of such offerings. Romanian nationals may avail themselves of a functional cryptocurrency exchange, i.e. www.btcxchange.ro, which amasses offers of coins and tokens from around the world. In December 2017, the Romanian company Restart Energy launched an ITO (details here: https://restartenergy.io/) to fund the consolidation of its local business and the global expansion of the Restart Energy franchise. Based on information from the company’s website, 100 % of the tokens were sold. We are not aware of other ICOs/ITOs in Romania. In 2017, approximately EUR 40 million was collected via ICOs in Slovenia. The most notable examples include Iconomi (a digital asset management platform), Cofound.it (a token sale start-up accelerator) and Hive Project (a blockchain-based factoring platform). Generally, is raising funds / crowdfunding outside the "traditional" capital market feasible/regulated in your jurisdiction? The Austrian Act on Alternative Financial Instruments (Alternativfinanzierungsgesetz – AltFG) allows for limited fundraising outside the scope of traditional capital markets legislation. The application of the AltFG is limited to SMEs. If securities are offered under the AltFG, a simplified capital markets prospectus will need to be prepared. In case of alternative financial instruments, certain information duties will apply. Crowdfunding is not regulated in Bulgaria and is generally feasible. Crowdfunding is not regulated, although the provisions of the Capital Market Act on public offerings could easily be applicable. Not regulated, but the HNB issued a guideline which rendered crowdfunding basically impossible. Crowdfunding is not regulated in Poland. So far, the PFSA issued positive opinions concerning crowdfunding projects, subject to observing certain minimum standards. Crowdfunding is not regulated in Romania. To our knowledge, the FSA has so far ignored crowdfunding and therefore this activity is likely to receive regulatory treatment in the future. At present there are several crowdfunding platforms active in Romania with a track record of successful campaigns, both for charitable and for-profit projects. There is no specific crowdfunding regulation in Slovenia (certain crowd-investing platforms were nevertheless successfully launched in the country). Due to the absence of regulation pertaining to crowdfunding, the regulatory status of such platforms (i.e. regulation of financial services, payment services, banking activity, consumer protection, etc.) would have to be assessed on a case-by-case basis.